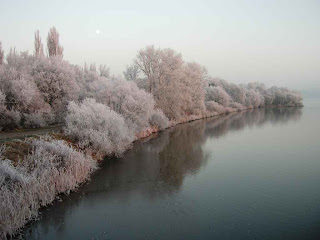 This is a shot down the Elbe ... it almost looks like a Bob Ross painting, what with all those 'happy little trees' on the waterfront covered in ice. 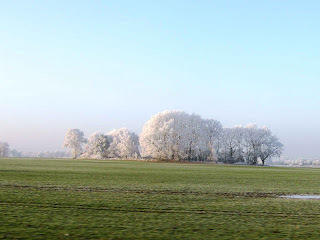 What was really intriguing was the way the trees were covered in the frost while the surrounding ground in a lot of places retained its brown or green hues. 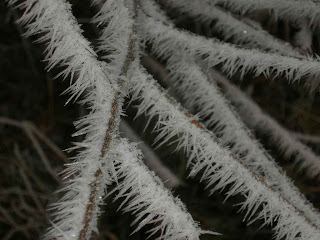 And here close up is what was going on ... the ice crystals look almost like pine needles. Didn't matter what the tree or plant was, it looked like a pine bough when seen up close. Truly a winter wonderland. Happy Christmas, or whatever holiday you celebrate, to you and yours. Beautiful, Mike, just beautiful!! Merry Christmas!!! (P.S. That white stuff covering everything is known as Industrieschnee. Beautiful but scary. anyway. it realy looks like one of his paintings. That isn't Industrieschnee. Industrieschnee is something completely different. You can find ice on the trees even when it hasn't snowed at all. When it is really cold the moisture in the air, especially when it is very foggy, freeze at the trees. This is all. It happens even far away from any industry. Great photos. It's all so pretty to look at but so treacherous to walk on! 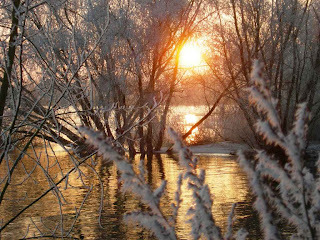 Its hoar frost. i love hoar frost!! We had something like this up north too, but it did not last. PS Are you in hibernation? Christmas was awhile ago.